[0:37] <YellowGTO> How goes it? [0:39] <YellowGTO> Anyone using a Pi for XBMC? [0:51] <SpeedEvil> On the subject of clocks - which people have raised. [0:51] <SpeedEvil> I diddn't know you could do that. [1:37] <Blacklite> i have a 5v 2a wall to USB from my nexus 7, could I use that without any problems? [1:40] <SpeedEvil> However - it's not ideal for the nexus 7. [1:40] <Blacklite> which i think are 5v 2.4a ? [1:42] <Ezro> If I'm trying to have an always-listening Pi that basically just searches and returns results, do you guys think SiriProxy would be best for that? [1:48] <SpeedEvil> Ezro: you do have an iphone? [1:48] <Ezro> I do not. [1:48] <Ezro> Ah, well, that solves that pretty quickly. [1:49] <Ezro> What about Sphinx? [1:49] <Ezro> I was looking into that a bit, but from what I read... it's a bit.. of a mess. [1:49] <SpeedEvil> What are you aiming at? [1:49] <Ezro> I would like to just be sitting on my couch and say "Computer: How tall is Nate Robinson?" [1:50] <Ezro> And then it responds with "5 foot 9". [1:50] <Ezro> And also have it possibly display search results on my tv, or something. [1:52] <Ezro> Uh... is that the... uh... Google Now? [1:55] <Bushmills> google must have seen that video, and thought "we need something better than that"
[1:58] <Bushmills> you need software to wreck a nice beach? [2:02] <SpeedEvil> I haven't found anything on linux that will get similar results to the software that came free with my scanner in about 1999. [2:30] <NullMoogleCable> whats the default rasperian password for root? [2:31] <pksato> root dont have a password. [2:32] <CEnnis91> im guessing that's available as of today no? [2:32] <CEnnis91> or wasn't it always? [2:32] <Blacklite> oh damn it! [2:33] <NullMoogleCable> Using username "root". [2:35] <CEnnis91> chithead: ah, referring to the improper testing? [2:35] <chithead> no. referring to the "always"
[2:47] <NullMoogleCable> whats the best remote desktop availible for the pi? [3:27] <NullMoogleCable> is the forum trashed? [3:28] <Blacklite> btw trying another card - still seems to be ridiculously slow! [3:28] <[Saint]> What block size are you using? [3:28] <atouk> on a usb 1.1 port? [3:29] <[Saint]> block size has a huge impact on the speed of the write. [3:30] <[Saint]> I admit I have a vastly faster sdcard, but I use a 4MB block size, and it takes about 40s to write the image. [3:32] <[Saint]> Perhaps the card reader just isn't particularly great. Dunno. Class 6 isn't exactly the fastest speed out there. [3:33] <Blacklite> lucky i'm in a design studio - lots of imacs + card readers! [3:35] <[Saint]> I /did/ pretty much just wake up, so my back-of-the-envelope-math could be off, but - you're actually getting a fair percentage of the write speed of an average Class 6 card there. [3:36] <[Saint]> Some cards seem to be capable of speeds beyond their Class rating, others I have noticed /just/ scrape by. [3:37] <[Saint]> Their manufacture isn't free of flaws. [3:38] <n_b> \o #rpi; I'm currently investigating low-power boards for usage with OpenCV and was curious what the current state-of-the-art on the Pi is; my understanding is that USB is pretty slow, but that the new camera module might be suitable for simple feature detection - anyone experimented much? [3:53] <dyu> is it possible to change the USB ports? both of mine are dead now. [3:56] <karlh626> I am looking for a "lean/small" terminal app for rasbian. ...any suggestions? [4:01] <Firehopper> dyu, sounds like you need a new eth/usb chip.. not something easily replaced. [4:01] <hydroxygen> dyu Raspberry PI's produced after August 25, 2012 have the USB polyfuses F1 & F2 removed (replaced with shorts). [4:03] <karlh626> ok, thanks for the ideas, just trying to squeeze every bit of performance out of the pi. [4:04] <Firehopper> I think its 24 hours..
[4:05] <hydroxygen> are they green or black ? [4:05] <Firehopper> what is wrong with it dyu? [4:05] <Firehopper> no power? or the ports dont work? [4:05] <Firehopper> have you checked via a mouse or something that the power is there? [4:06] <Firehopper> have you checked power lines on the ports with a voltmeter? [4:07] <Firehopper> if theres no power then there might be fuse issues. if the power is good.. then you toasted the ethernet/usb chip..
[4:08] <dyu> either way, it means i have to buy a new one. correct? [4:09] <Firehopper> but if its a poly fuse issue, it could be fixed..
[4:09] <dyu> Firehopper: could you point me to reading material for that? [4:09] <Firehopper> do you have a dvm? [4:10] <Firehopper> someone got a good link for dyu on how to check the ports for the proper voltage? [4:22] <Blacklite> is that even fast enough to use? [5:33] <RonOverdrive> sup, anyone awake? [5:44] <RonOverdrive> I got a micro-usb power supply and a powered usb hub, could that be causing issues? [5:45] <nerdboy> everything in the hub? [5:46] <nerdboy> what's the rating on the pi's power supply? [5:52] <atouk> are you sure it's chicken? [5:53] <[Saint]> You know its good if DNA sequencing can't tell you what it is! [5:54] <[Saint]> It must be rare, and, therefor - tasty. [5:54] <[Saint]> No, no, different story altogether. [5:54] <atouk> you mean there's NEW ones? [5:54] <[Saint]> This was actually older. [5:56] <[Saint]> It was some study that sequenced the meat in "lamb" curries from a few outlets. [5:57] <[Saint]> IIRC, at least one came back containing no meat at all. [6:01] <RonOverdrive> hey they got the patent on water didn't they? [6:06] <RonOverdrive> dunno, there's plenty of prior art out there so I don't think either claim will last. [7:57] <[Saint]> did you need to shave the board down at all? [7:57] <[Saint]> I assume it has an uSD/SD adapter flush with the board as well? [7:58] <[Saint]> As fir the sdcard? or, is it sticking out the back? [8:00] <[Saint]> Oh, I see. That initial image did a nice job hiding how much of the case has been cut away. [8:00] <[Saint]> That's why I was so surprised. [8:29] <JakeSays> so once a pi has booted from a hdd, can the sd be removed? [8:32] <ShiftPlusOne> Hm, you're in a bit of a pickle then. [8:32] <ShiftPlusOne> geordie, why not? [8:32] <ShiftPlusOne> presumably the firmware and kernel are all in ram, so what's the sd card for? [8:38] <ShiftPlusOne> Though a pi controlled nuclear reactor would be nice. [8:38] <ShiftPlusOne> I wouldn't want to live anywhere near it, but still. [8:50] <Jck_true> What happend to the house sized nuclear reactors we have been promised anyway? [8:51] <Jck_true> JakeSays: Pi-ish controller? [8:51] <ShiftPlusOne> I was never promised that. O_o Was that a kickstarter or something? [8:52] <yehnan> Hi, i'm using Raspbian and LXDE. After pressing the logout icon on the bottom-right cornor, it only shows "Logout" and "Cancel". There is not "shutdown" or "reboot". What should I do? [8:52] <Jck_true> JakeSays: Uhm - install OpenWRT? or OpenTomato? [8:53] <ShiftPlusOne> Jck_true, yeah, I got that. [8:54] <JakeSays> Jck_true: near as i can tell it is. the issue apparently is the wireless driver is close source. [8:54] <Jck_true> Uhmm say what? [9:01] <yehnan> maumushi: that's not what I want. [9:04] <JakeSays> yehnan: well, its all open source - use your imagination. [9:16] <yehnan> Jck_true: I did google. [9:17] <yehnan> Triffid_Hunter: wow, if use "sudo startx" to start x window system, it did show "reboot" and "shutdown". thanks a lot. [9:22] <yehnan> Triffid_Hunter: well, what should I do? install slim? [9:24] <[Saint]> I think the user also needs to be part of the 'power' group too, no? [9:25] <ParkerR> yehnan: Is consolekit already installed? [9:25] <yehnan> ParkerR: Raspbian seems to not have a group named "power"
[9:26] <ParkerR> yehnan: So consolekit IS installed and that line didnt work? [9:28] <ParkerR> Did it throw an error when you tried startx or what? [9:29] <yehnan> ParkerR: consolekit is already installed. [9:31] <[Saint]> there/s a chance you'll need to logoug and log back in. [9:31] <[Saint]> jeeez. can't type. uuugh. [9:32] <yehnan> ParkerR: I login and long out. One line is (lxsession-logout:11007): WARNING **: dbus-interface.c94: DBUS: The name org.freedesktop.UPOwer was not provided by any .service files. [9:32] <yehnan> ParkerR: there are many other similiar output lines, for UPower and Hal. [9:47] <melwyn> hey. is there a way to prevent the pii from booting when attached to a power source? for example: i can connect the usb and start the pi a while later with a switch, thanks! [9:47] <[Saint]> You can add a reset switch to the P6 header. [9:48] <[Saint]> that lets you ring it up again after powering down. [9:48] <[Saint]> ...as long as the supply is still attached, that is. [9:48] <yehnan> ParkerR: cat /etc/group | grep power returns nothing. [9:49] <[Saint]> ParkerR: true - but this was he can shut it down and leave it with the power supply attached and bring it back up when he needs it. [9:53] <maxinux> whats funny is thats about what you get with a beaglebone really easy.. and faster hardware..
[9:53] <ParkerR> What do you define as reasonable? [9:54] <yehnan> ParkerR: still only logout and cancel. [9:57] <maxinux> saved you a meg.. how much is that coloorful ps app using? [9:58] <maxinux> whats free say? [9:59] <piranhaxx> what is your favorite way of capturing sound with raspberrypi? any chance you have USB device recommandation? [10:01] <ParkerR> What the -h? [10:12] <gordonDrogon> morning soggy raspberries. [10:12] <gordonDrogon> it's rainy here. [10:26] <[Saint]> That highlight scared the pants off me. [10:26] <[Saint]> ...watching a movie with a *very* quiet audio track. [10:42] <gordonDrogon> libreoffice ... onna pi? bit slow, isn't it? [10:42] <gordonDrogon> I use latex for all my writing stuff - it runs OK on the Pi. 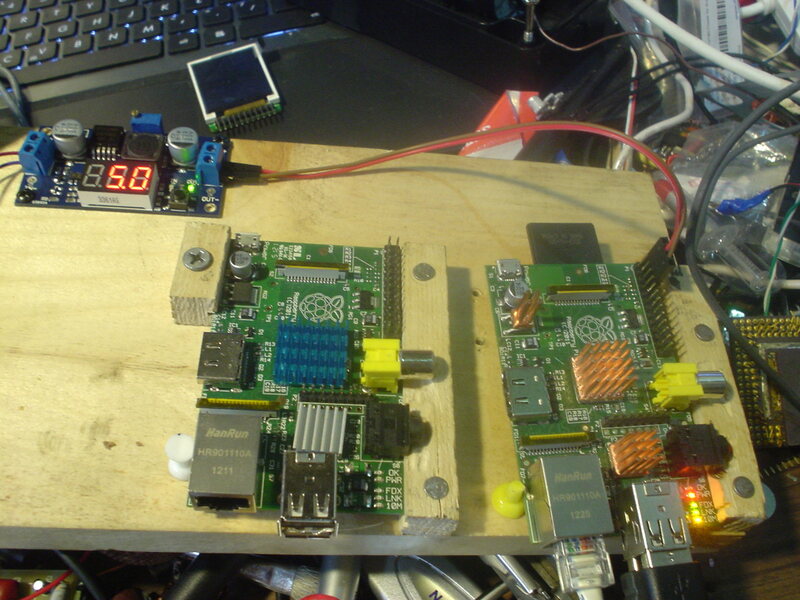 [10:43] <gordonDrogon> I thought about trying to use a Pi as a regular 'desktop' PC. [10:43] <gordonDrogon> I think the lack of youtube inna browser is a stumbling block right now. [10:47] <gordonDrogon> it depends on what I use the desktop for - for me, it's mostly xterms, vi, C compiling, or editing php, & web browsing. [10:51] <ParkerR> BurtyB: That's the sad thing. It isn't a RAM limitation. The CPU just isn't powerfule nough. [10:56] <gordonDrogon> might see if using it as an X terminal is faste & run the browser, etc. on a server. [10:57] <gordonDrogon> no, not ssh at all, but native X remote displaying. [10:57] <gordonDrogon> it uses encryption. don't need that. [11:04] <gordonDrogon> it's because everyone wants to track you and sell your data. [11:09] <gordonDrogon> and a cookie blocker too, but some sites get really upset with that. [11:09] <gordonDrogon> Collusion is also an intersting plugin in firefox..
[11:23] <gordonDrogon> kinda sad that we feel we need all that. [11:23] <gordonDrogon> but the end-users (that's us) are no more than a commodity now to the "big data" people. [11:25] <FR^2> Indeed. And that's the sad thing. [11:26] <txomon|fon> how are img files generated usually? [11:26] <knoppies> txomon|fon, you mean dd? [11:27] <knoppies> txomon|fon, I wouldn't know. [11:30] <gordonDrogon> typically mount it in another Linux box and dd/gzip it if you want a snapshot to distribute, that's not without its issues though. [11:30] <gordonDrogon> before you do that, fill the unusedspace with zeros though - compresses better. [11:31] <gildean> txomon|fon: the first two senteces on the page: Partimage is opensource disk backup software. It saves partitions having a supported filesystem on a sector basis to an image file. [11:39] <Triffid_Hunter> txomon|fon: what, like cat /dev/mmcblk0 | ssh me@othermachine 'cat - > rpi.img' ? 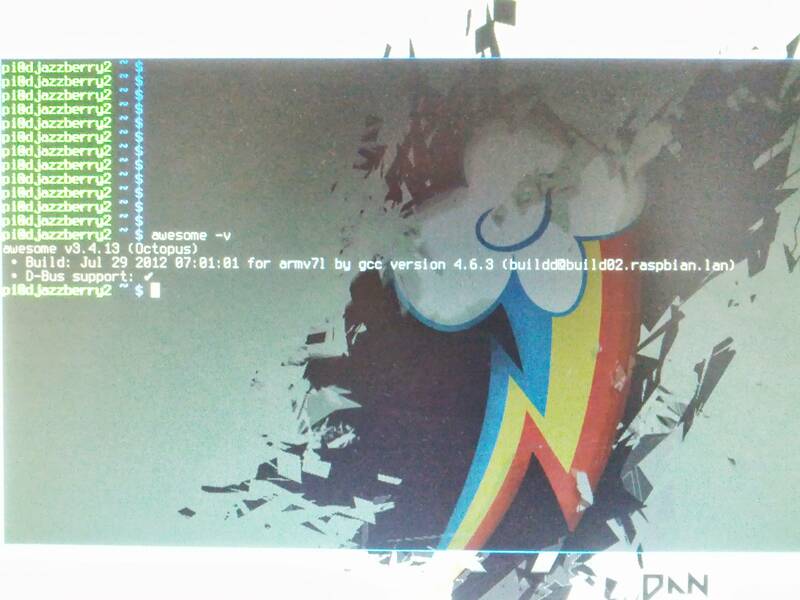 [11:49] <djazz> weird, the awesome package in raspbian is "built for arm7l", i thought only armv6h was supported? [11:51] <nid0> txomon|fon: yes, you want to take your running rootfs and turn it into an img file right? [11:52] <txomon|fon> maumushi: but how may I create hardlinks? [11:53] <Triffid_Hunter> txomon|fon: mount the filesystem. manipulate as necessary. [12:05] <gordonDrogon> If you're trying to create a .img like the foundations .img files, then it's not the right tool. [12:07] <maumushi> yes, but ... are not all the linux distrib bootable file to put on usb/sd/cd iso ? [12:11] <gordonDrogon> maumushi, not for the Pi - the 'img' file is litterally an image of a 2GB SD card, complete with partition table and (normally now) 2 partitions. [12:11] <gordonDrogon> or a slught smaller than 2GB card as some 2GB cards are slightly smaller. [12:15] <maumushi> pi will work with one partition only ? [12:17] <maumushi> i know, but will it work with 1 only ? with boot and root togheter? [12:37] <FR^2> maumushi: There's no necessity for two separate partitions for boot and root. [12:38] <FR^2> I'm not on drugs. [12:39] <[Saint]> None of the 'ol moloko plus, then? [12:44] <gordonDrogon> maumushi, you need 2 as Linux won't run (easilly) off a FAT filesystem. [12:44] <gordonDrogon> so /boot is FAT, / is something else. [12:45] <FR^2> Ah, yes, that's a thing indeed. [12:46] <FR^2> I totally forgot about that. [12:47] <gordonDrogon> The ROM on the GPU can only read FAT - nothing more sinister than that. [12:48] <gordonDrogon> more like easy - there are many libraries to read FAT from a micocontroller these days. [12:48] <[Saint]> No. I don't think you could. [12:48] <[Saint]> Permissions, or lack thereof, would make it...interesting. [12:49] <[Saint]> At the least, it would be an insecure nightmare. [12:49] <[Saint]> At the worst, it simply wouldn;t work at all. [12:49] <gordonDrogon> it doesn't support the file types needed to represent Linux devices. [12:49] <[Saint]> FR^2: that's how I'd do it. [12:50] <gordonDrogon> there is an overlay layer that someone mentioned recently though, but its name has escaped me. You'd need to make sure it was compiled into the kernel though. [12:50] <[Saint]> A loopback image of a saner FS on FAT. [12:50] <nid0> a question though, is: why? [12:50] <nid0> where's the complication with 2 partitions? [12:54] <[Saint]> you need it if you want LLVM et al. [13:10] <vadmeste> Hello everybody. I have a problem about my sdcard corruption and then I got an idea. It's not perfect but I would like to know if it works or not. I want to create an read only partition where I put all binaries and static files. Will that keep my partition safe from corruption ? What about the definition partition table ? It is already read-only as I guess, am I right ? Any comments ? [13:11] <gordonDrogon> far better to work out what the source of coruption is and fix it. [14:23] <berak> can i assume something like alsa or jack for sound ? would rtaudio work ? [14:29] <ShorTie> not far enough for me, lol. [14:43] <Firehopper> http://www.flickr.com/photos/firehopper/8877755869/ < reason my car was loud on the way home last night. [14:46] <gazzwi86> I'm trying to follow as many good maker blogs as possible. So aside from instructables, make, and rpi, what good sites can i follow? [14:48] <gordonDrogon> and most with raspberry pi tag ..
[14:52] <SpeedEvil> Mikes electric stuff - excellent often in depth investigation of hands-on matters, welding tips and tricks - welding is fun!, Ben Krasnow - who is too awesome for words 'DIY backscatter X-ray' - and Matthais Wendal - who makes great things from wood. [14:59] <SpeedEvil> On a less serious note. https://www.youtube.com/watch?v=Y4wRdM4vBFk - how to make a popular youtube video. [15:20] <gazzwi86> I've hooked my rpi to a del modem directly. How can i log into it via ssh? Would I need to grab the IP via the box? [15:21] <gazzwi86> intact, how could I set up a server that I could log into remotely? [15:22] <gazzwi86> I have no desktop interface? Am I looking for VNC's? [15:22] <gordonDrogon> a modem ? [15:22] <gordonDrogon> what a strange concept. [15:22] <gordonDrogon> Do you mean a DSL modem? [15:24] <gordonDrogon> you'll need to work out what your ISP needs - PPPoE or PPPoA and how the modem handles it. Some are (nice) protocol converters, (oA to oE) but you might alreadt have that sorted. [15:24] <gordonDrogon> why won't it be static? [15:27] <gordonDrogon> gildean, I use a nice ISP that gives me static IP addresses. [15:27] <gordonDrogon> it depends on the ISP and their policy. [15:28] <gordonDrogon> the important thing is that you need to run the pppoe (usually) in the Pi - it is the end-point, so it needs to do the authentication to the ISP, etc. [15:28] <gordonDrogon> gildean, sorry - in the UK where I do, only the cheap ISPs provide dynamic ones. [15:28] <gordonDrogon> and you get what you pay for. [15:29] <gordonDrogon> do you know what your ISP needs in the way of pppoe/oa, etc. ? [15:30] <gordonDrogon> gildean, aargh. didn't notice that. oh well, his loss. [15:31] <BurtyB> gordonDrogon, yup lots of people on virgin media for a start..
[15:34] <gordonDrogon> poor people who can only afford services like that. Good job they're not my customers. [15:35] <gordonDrogon> and yes, I'm a complete snob when it comes to internet provision - it's part of my income and when I moved away from the low-quality providers, life suddenly got a whole lot better! [15:36] <gordonDrogon> PI at home, or even a small office these days is a bit of a luxury though. You probably work or run an ISP. [15:52] <gordonDrogon> I think a lot depends on the kit the ISP is using at their end. [15:52] <gordonDrogon> although some ISPs deliberately force a disconnect to make sure you get a new IP address. [15:53] <gordonDrogon> the ISP I use don't have a policy of forcing a regular disconnect - I only get disconnected when BT kick something in the exchange. [15:54] <arcanescu> is there a way to make the wifi dongle on the pi as an AP ? [15:55] <gordonDrogon> I think the answer is yes; but it depends on the dongle. [15:55] <gordonDrogon> Connection Status Online (7days 22hrs 54mins 23secs) Hm. not the longest I've seen for my own connection. wonder what BT did last week. [15:55] <gordonDrogon> arcanescu, you'll need to google it's make and suitability. [16:01] <Triffid_Hunter> nid0: they don't have much to say when you state "since you've clearly and adamantly demonstrated that you have zero clue, I'll need to speak to your supervisor and place a complaint before signing anything"
[16:14] <gordonDrogon> virgin has always been fibre to the cabinet - so no different to saying that BT's FTTC is the same. [16:15] <gordonDrogon> pretty sure teleworst was all fibre to the cabs in Bristol when I was there. [16:16] <gordonDrogon> maybe before fibre was "trendy"
[16:17] <gordonDrogon> all ISPs lie IMO. [16:17] <Chaz6> "Oh actually that fibre we sold you wasnt really fibre"
[16:26] <IT_Sean> does google fiber keep you regular? [16:40] <pagios> anyone using an easycap please? [16:41] <pagios> arcanescu: i got it working but the image is always rotating when playing it is not stable any idea? [16:41] <arcanescu> pagios: explain rotating? [16:41] <arcanescu> i mean does it keep flipping? [16:42] <nailora> hi there. i want to shine leds with my script. the leds should keep shining after my script exits. this is why i do not put a gpio.cleanup() call at the end (or is there another way to achieve this?). now on the next run, i get the dreaded "RuntimeWarning: This channel is already in use". i can fix the warning with gpio.cleanup() but then the lights go out. can i have both? shining LEDs *and* no warning? [16:42] <pagios> arcanescu: any idea which driver name it runs? [16:44] <nailora> Triffid_Hunter: umm... if this was the solution I'd rather keep the warning. [16:46] <nailora> JakeSays: yeah I wondered if this shine-my-leds deamon or server was the intended architecture and then decided that it would be massively overkill. [16:47] <JakeSays> nailora: since when is doing it right "massive overkill"? [16:47] <JakeSays> yeah lets get it done is for fools. [16:50] <JakeSays> and since the pi is geared toward education, lets take the opportunity to foster doing things right. [16:52] <JakeSays> gildean: which npm did you use? [16:52] <gordonDrogon> I'm quite surprised that the pithon libraries turn stuff off when the program exits though. [16:53] <arcanescu> nailora: i still dont see the problem in disabling a warning? [16:53] <nailora> arcanescu: as mentioned above: that is what i will do. 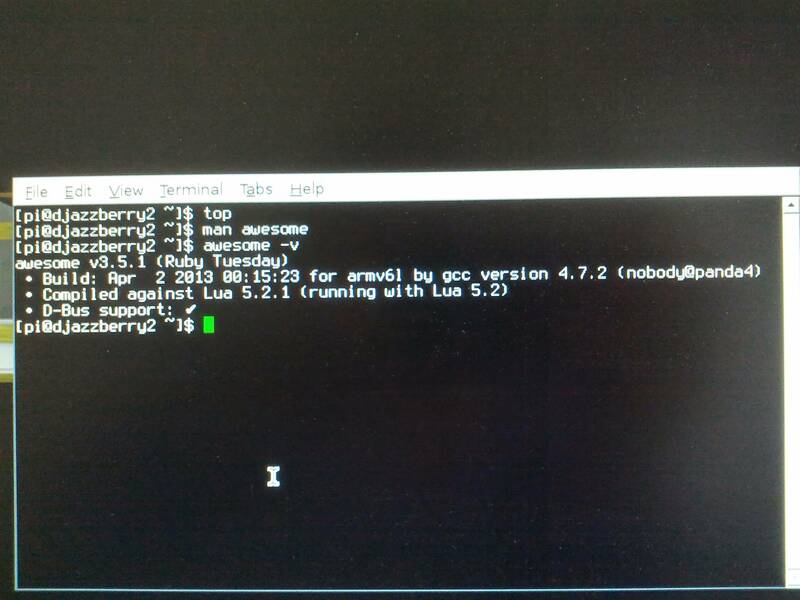 [16:54] <djazz> whats the best way to install the up to date nodejs on the pi? [16:55] <djazz> in the repo? [16:55] <nailora> arcanescu: imho this is the best compromise of pure/correct/working/simple. no need to overengineer / premature optimization. [16:56] <arcanescu> nailora:for your scenario or webopi? [16:56] <nailora> arcanescu: my led thing. [16:56] <djazz> how do I install it? [16:56] <djazz> paste in /usr ? [17:02] <JakeSays> gildean: ah you werent using interrupts? [17:03] <gildean> JakeSays: in what way? [17:03] <gildean> JakeSays: you didn't read the post? [17:04] <arcanescu> pagios: ls /dev/vid* ? [17:04] <arcanescu> you dont have video0 ? [17:05] <arcanescu> pagios: are you in the states? [17:06] <JakeSays> gildean: which leds are you blinking, and what buttons are you using? [17:08] <JakeSays> gildean: lol ah ok. was just making sure there weren't buttons on the pi i wasnt aware of. [17:10] <pagios> arcanescu: i would like to get that into gstreamer, any idea? [17:11] <Firehopper> stuff to fix car is $360, that includes new front brakes and pads. [17:12] <Firehopper> the pipe was $180 alone. [17:12] <pagios> arcanescu: how can i pick video 16 for instance ? [17:18] <JakeSays> arcanescu: what is webopi? [17:19] <pagios> arcanescu: did you try getting it into gstreamer? [17:42] <IT_Sean> you just got your first pi? [17:42] * AlphaPinky is wondering what he can do with this Pi. [17:42] <AlphaPinky> I tried to import two to Brazil but the custom didn't let me for an unknown reason (to me). [17:43] <AlphaPinky> So I had to buy one and host it in Netherland. PcExtreme offered free hosting for Raspberry Pi. [17:43] <IT_Sean> Well, what do you plan to do with it, now you have it? [17:43] <AlphaPinky> I think run Node.JS. [17:43] <AlphaPinky> I wish I could also run CJDNS. But I think it is too heavy for the slow processor, so I'm skipping it for now. [17:44] <AlphaPinky> I also would like to VPN to my Pi. [17:44] <AlphaPinky> tbh. I bought the Pi without knowing what I would do about it. [17:45] <Twist-> AlphaPinky: Many of us did. It's cheap enough for an impulse buy. [17:46] <AlphaPinky> What did you do? [17:47] <JakeSays> schnuws: why what? [17:47] <schnuws> for monitoring mouse deaths? [17:48] <JakeSays> schnuws: lol oh. no, its a live trap. [17:48] <AlphaPinky> I don't have physical access to this first Pi i'm having. it is hosted in a datacenter. As I got a 16Gb SD. I am going to use it as a server. [17:48] <JakeSays> AlphaPinky: lol a data center? [17:49] <AlphaPinky> Yes. They host Raspberry Pi for free at PcExtreme.nl. [17:51] <AlphaPinky> That seems very nice. I wish I could automate my home using it. [17:54] <johnc-> did you run out of space on it? did you expand the filesystem to the size of the card? [17:55] <AlphaPinky> Does the Raspberry Pi crash often? [17:55] <AlphaPinky> I wonder how long it will run without crashing. [17:58] <johnc-> you can crash it?! [18:08] <AlphaPinky> I'm using it as a server. [18:08] <Amadiro> videocore, it's the graphics card part. [18:08] <AlphaPinky> I don't use it. [18:08] <AlphaPinky> My goal is to use it as a webserver (node.js+mongodb) + vpn gateway. [18:09] <AlphaPinky> I thought it was related to graphics. [18:11] <AlphaPinky> I've set video memory to 16mbit only. Is that fine? [18:12] <Triffid_Hunter> about 8x more? [18:13] <Triffid_Hunter> although I've never seen milli-bits used for anything, ever! [18:15] <Triffid_Hunter> Amadiro: now that sounds like an interesting article.. link? [19:00] <Solenki> I'm trying to design a case for my pi, can anyone help me, I have some questions. [19:02] <schnuws> ahaa! broadcom = 25 => gpio 4 ? [19:04] <schnuws> or am I supposed to use the pin number? 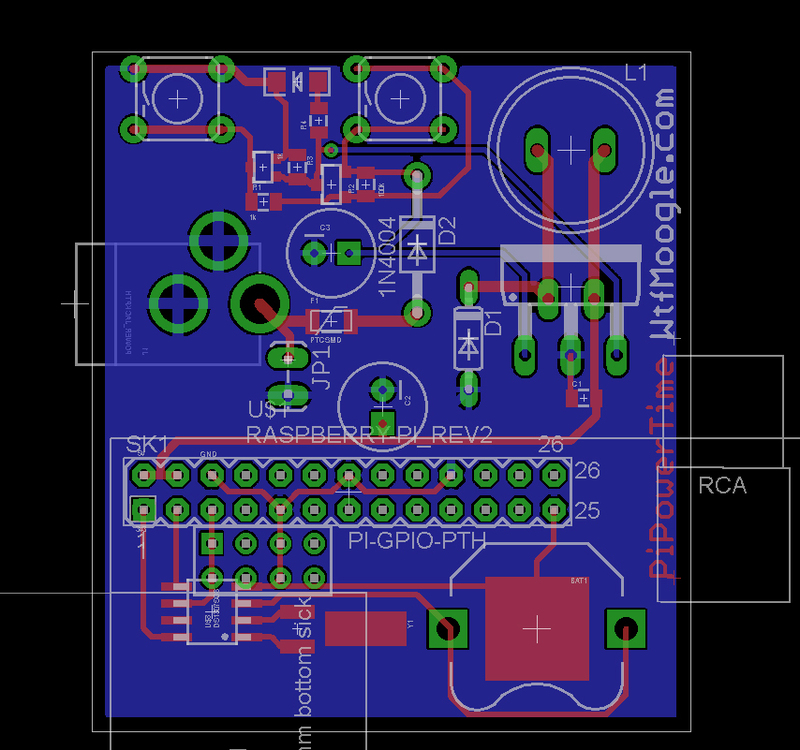 [19:04] <schnuws> GPIO 6 = pin 22 ? [19:22] <boggle> Anybody got a recommendation for a webcam low power enough to avoid the use of a USB hub? I've got an opencv dashcam thing in mind. [19:29] <wroberts1> howbout camera with its own power supply? [19:31] <boggle> What, is that a custom solder you did or something? [19:33] <boggle> Bushmills: any recommendations? [19:34] <Bushmills> not especially. see whether they are available for 5 volt, so they can be driven from the same power source. [19:36] <boggle> Triffid_Hunter: I don't suppose you have a more detailed explanation posted somewhere, do you? [19:43] <boggle> Triffid_Hunter: any particular type of wires? [19:44] <IT_Sean> Thats some sloppy soldering, man. [19:46] <IT_Sean> Triffid_Hunter: does that improve USB performance? [19:46] <IT_Sean> i.e. does it still hang or reboot when hotplugging USB? [19:46] <ShorTie> how do i get #include<iostream> ?? [19:49] <IT_Sean> well then... so much for that. [19:51] <Triffid_Hunter> ah that's unfun. got an available child or friend who has got the motor control? [19:51] <Triffid_Hunter> would love to hear someone else's before and after, as long as it doesn' t involve the phrase "and then fire came out"
[19:57] <schnuws> Would it be possible to close down emulationstation and then enter xbmc and vice versa, just with an input signal from gpio? [20:16] <ParkerR> :D Doing an idle test of a cheap rechargable USB battery with the Pi. Some normal usage in the beginning and letting it idle it's gone for a hour now. [20:21] <IT_Sean> Is there any indication of the percentage of battery remaining? [20:22] <IT_Sean> Died completly, or did wifi just drop off? [20:23] <IT_Sean> so, about an hour of runtime. [20:23] <IT_Sean> not bad at all. [20:24] <IT_Sean> I'm shocked it was stable at 4.21v, ParkerR. [20:24] <IT_Sean> The CPU, the network adapter, and anything hanging off a USB port. [20:29] <Bushmills> but there's also nfs, and autofs. [20:36] <r4> http://www.amazon.com/Kootek-Aluminum-Heatsink-set-Raspberry/dp/B00C8NNZ36/ref=pd_sim_pc_6 <---waste of money or worth it? [20:36] <NullMoogleCable> is there a wayland download yet? [20:47] <Ely_arp> 1200 wow...are you water cooling? [20:51] <ParkerR> NullMoogleCable, wtf is wrong with your server "50% [==================> ] 196,292 --.-K/s eta 30s"
[20:52] <Bushmills> can you write anything at all to SD card? touch foo ? [21:13] <MannDude> Hey folks. Pardon my ignorance, but I just got the Raspberry Pi today. Trying to find a guide on how to flash the .img file for Raspian to my SD-Card. I'm rocking CrunchBang at home, which is Debian based. Having trouble Googling because Google does not like my g'damn VPN IP and won't let me search. [21:14] <NullMoogleCable> is there a way to network boot a pi? [21:15] <IT_Sean> you'd still need the SD card for the initial boot. Beyond that, i'm not sure what would be involved. [21:16] <NullMoogleCable> what about say a spi flash chip? [21:18] <IT_Sean> The raspi can only boot off the SD card. It looks there, and only there, for boot instructions. You can then pass the boot process off to another device. [21:26] <gordonDrogon> MannDude, got it going yet? [21:26] <MannDude> Uhh, not yet. [21:27] <gordonDrogon> MannDude, if you get the SD card plugged ito your Linux PC then it's a simple 'dd' command. 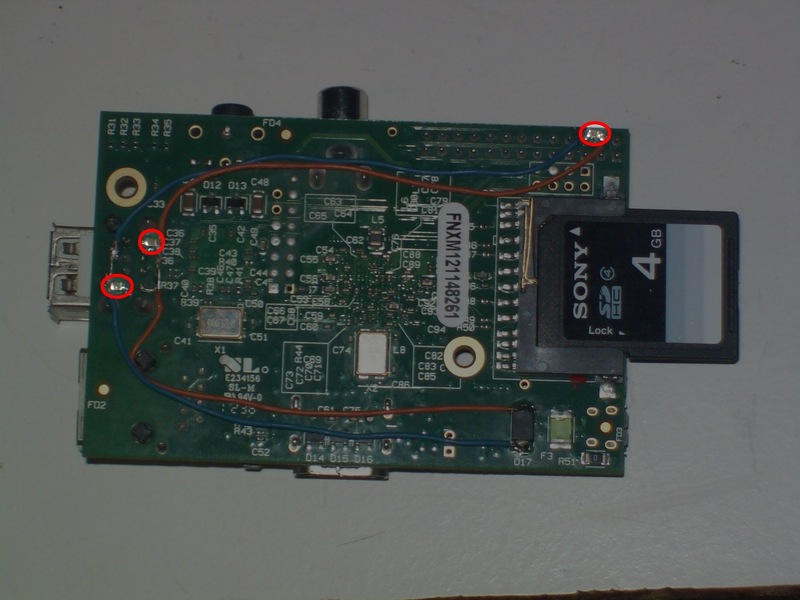 [21:28] <gordonDrogon> you work out the device of the SD card in your Linux box - it's usually /dev/mmcblk0 for an in-board reader, or possible /dev/sdb (or sdc, sdd, etc.) for a USB connected one. [21:29] <gordonDrogon> then dd if=image.img of=/dev/mmcblk0 bs=8M and off you go. [21:34] <Tachyon`> hi, anyone know if electrolytic cap electrolyte is basic or acidic? [21:37] <taza> My go-to cleaner is also isopropyl alcohol, mostly because pure ethanol is hard to source. [21:38] <taza> But, in this specific case, I'd go with water, heh. [21:39] <IT_Sean> harrisr: taking pcitures, mostly, i suspect. [21:41] <chris_99> you know what it's called? [21:54] -NickServ- This nickname is registered. Please choose a different nickname, or identify via /msg NickServ identify <password>. [21:54] -NickServ- You have 30 seconds to identify to your nickname before it is changed. [21:54] -NickServ- You are now identified for DataBot. [21:54] -MemoServ- You have 2 new memos.